At O Nails & Spa we believe that looking your best and feeling your best shouldn’t be a trade-off when it comes to your nail and skin care. Inspired by health and wellness, our line of services incorporates the perfect blend of organic ingredients and quality products. From our patented vinotherapy skin treatments to our detailed professional nail care, our services leave your hands, feet, and body looking beautiful and pampered for a head-to-toe glow! Our salon is BPA, phenyl phthalate, and “big five" free. "Big five free" means our polishes are free of the most toxic ingredients contained in many traditional nail polishes: formaldehyde, toluene, dibutyl phthalate (DBP), formaldehyde resin, and camphor. We strive to use organic, naturally sourced alternatives whenever possible. Come and experience the luxury of O Nails & Spa! O Nails & Spa is dedicated to flawless nails. Inspired by the latest nail trends, we carry over 500 shades of polish and premium brands including Chanel, Dior, Butter, and many more! Our manicures and pedicures come standard with hot stone massages, handcrafted organic oils, creams, and hot towel wrap to soothe and pamper your hands and feet. Our premium spa packages include our patented vinotherapy skin treatment made from the remnants of winemaking and Swiss Apple Stem Cell paraffin wax to restore and rejuvenate your skin. A complimentary glass of locally handcrafted wine, artisan beer, coffee, or tea is the perfect pairing for a relaxing spa experience. Experience O Nails & Spa with friends and family and celebrate your special event! Whether you are hosting a corporate gathering, bridal party, or just want to have a fun get together with friends, we are here to pamper you and your guests. Come, relax, and enjoy! Come visit our beautiful new spa and book an appointment today to receive a 25% OFF on all services. This Grand Opening special offer expires at the end of June. 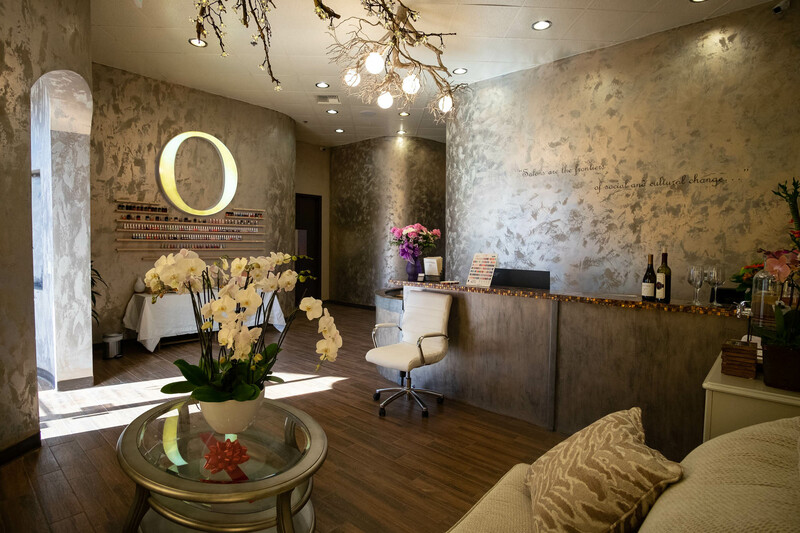 Come check us out and experience the luxury of O Nails & Spa! © 2018 Organic Nail & Spa, All Rights Reserved. Designed by Web Tech Enterprise, LLC.